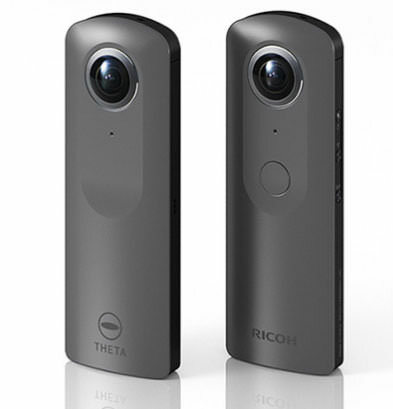 The latest version of the Ricoh Theta is official and it offers 4K 360-degree video and spatial audio recording. Ricoh has released the full specs for the new Ricoh Theta action camera which captures 360-degree video and stills. We now know that the new Theta, which captures 360-degree video at 30fps in 4K (3840x1920 pixels), is called the Ricoh Theta V and it also features a built-in 4 channel microphone that can record spatial audio that links to 4K videos. Those who are fans of live streaming can share their 360-degree 4K videos as they record them and the camera can be connected to smart devices via Bluetooth or Wi-Fi. As well as improving video/stills quality, Ricoh has also made sure the new 360-degree camera doesn't eat through its battery too quickly. They've done this by using a new image sensor along with a Qualcomm Snapdragon processor and the Qualcomm Connected Camera Platform. White balance has also been improved along with exposure accuracy and 14MP stills can now be produced. The camera runs on an android based operating system so plug-ins can be used and functions can be continuously added to the camera. In fact, Ricoh is working on adding a function that allows 360-degree video to be stitched before transfer and a new client mode will allow the camera to be constantly connected to the internet via a wi-fi network while the camera is controlled from a smart device. Footage captured with the camera is compatible with all major social networks and transfer speeds are now 2.5 times faster than previous models so you'll be sharing your adventures with friends much quicker. Other features include shutter speeds up to 1/25000 seconds, an ISO range that reaches ISO3200, internal memory that has room for 4,800 stills (19GB) and interval shooting at 4 seconds. Optional accessories include waterproof housing and a microphone. The Ricoh Theta V will be available from the end of September 2017 with an RRP of £399.99.